Mo’s Ferry vinyl #73 is Patrick Vano’s third release on the label and a worthy follow up to his 2013 album „The Other Side Of Me“. For Mo’s Ferry Patrick Vano is not only a reliable producer of functional peak time material, but also an incredibly talented dj who prooves his skills on regular label showcases as well as the I Love Vinyl open air. 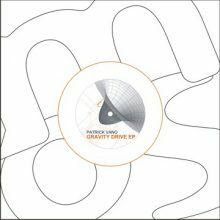 On his new „Gravity Drive EP“ Patrick Vano manages to combine three dj tools, of which – depending on the playtime – at least one piece should match.